The Oracle BI Cloud Service provides the possibility to upload metadata models (via lift & shift) created with the OBIEE Admin Tool (rpd file), but also comes with a new web modeler to create metadata models directly within the web UI. These web model files are not compatible with the rpd file and are stored internally as json files. The BICS instance is also limited to an either or approach. Once, a rpd is uploaded as a model e.g. containing the data source connections, the web modeler can not be used anymore. · The web modeler only supports a single Physical Table /View for a logical table (Fact or Dimension) since no LTS (Logical Table Sources) are available. · Since no LTS is available, it is not possible to use the Content Tab of the LTS to specify a Where Clause to be applied to limit the Rows. · No renaming wizard in web modeler to quickly change the physical table names into meaningful business names. · Cross Subject area Analysis does only seem to work with rpd lift and shift. When using web modeler the option of “adding other Subject areas” is always greyed out. This influences the modelling of the Models, since it is possible to create a united Model having all required tables. However, this “united” model maybe a duplicate and must be created from scratch again. · Joins between Fact and Dimension Tables may only be based on a single criteria. Joins can’t be specified using a second criteria using the AND logic. And Joins can only be Inner Joins. Obviously, the above list is non exhaustive and should only provide a first level information, since any BICS instance is limited to only one approach. Within a cloud scenario the BICS development life-cycle is quite the same, but requires some additional steps and some decisions on the development model: either using web-based BICS developer or upload of full RPD file developed using OBIEE Admin Tool. the capabilities of this web-based Modeller are more limited. Due to this there is no option to edit or change the uploaded RPD file within the web-based BICS modeller afterwards. The process to upload a locally developed (OBIEE) metadata model (.rpd file) to the BICS Cloud is called “lift&shift”. 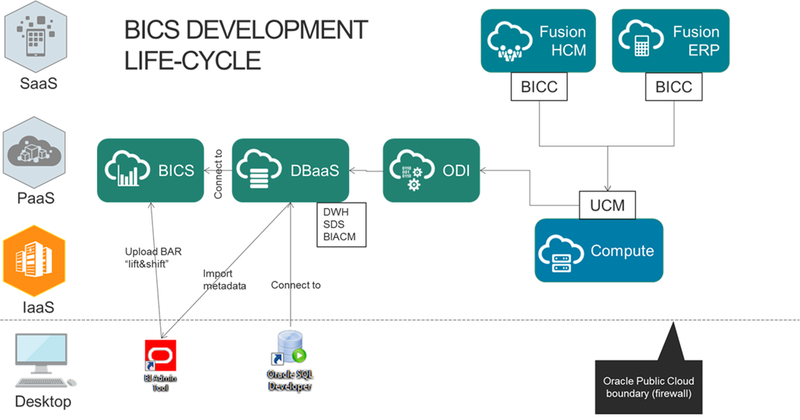 For the BICS development life-cycle setup the data of the Fusion Cloud e.g. HCM or ERP is assumed to be already present within a Oracle Database Cloud (DBaaS/DBCS). For this setup all components (formally probably referred to as “server” components) are provisioned on the Oracle Public Cloud behind a firewall and only the IT Development Tools (IDE) are installed on a developer machine like a desktop or laptop. BICS DBaaS Connect the BI Cloud (BICS) to the Database Cloud (DBaaS) to analyse the stored data e.g. 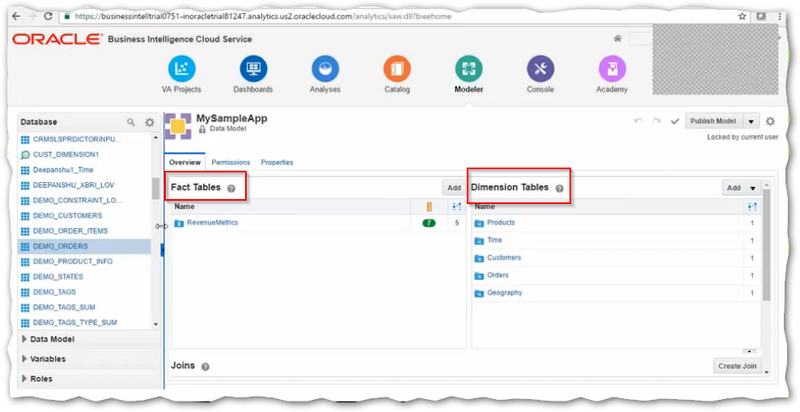 extracted Fusion HCM data How Does Oracle BI Cloud Service Integrate with Oracle Database Cloud Service? as described in this article from Oracle.